Fall is in full swing and so is the seasonal menu staple no one can escape: pumpkin spice. The autumnal flavor, long found in pies, breads, and beers, experienced a boom in popularity in recent decades and is now found in everything from Oreos to dog treats. 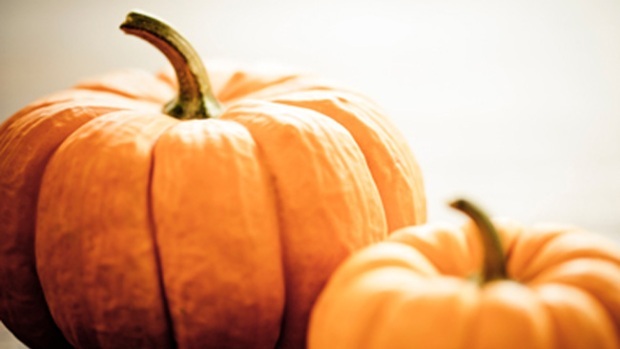 Quiz: How Pumpkin Savvy Are You? America’s love of the orange squash dates back to the New World, as historian and author Cindy Ott recounts in her book “Pumpkin: The Curious History of an American Icon.” In an interview, Ott explained how the simple pumpkin went from being a “last resort” food to an American favorite. When did pumpkins become a part of American cuisine and culture? Pumpkin is actually the oldest domesticated plant in the new world. It was domesticated in 10,000 BC in Mexico, so it’s older than corn and beans. Indians in America in precolonial times relied on pumpkin for daily sustenance and they had all kinds of special ceremonies — many of them did celebrate pumpkin. But for Europeans, it meant something much different. For them, it was associated with natural abundance like it was for Indians, but then it had connotations of being a symbol of wild nature and cultural backwater. So people ate it when they had to but then they preferred to eat European food, like potatoes and onions and cabbage, when they could. When did pumpkin move from a food of “desperate times” to say, a seasonal treat? First of all, all forms of squash and pumpkins are interchangeable, they’re botanically interchangeable—you can crossbreed a zucchini with a field pumpkin and get a mix. It wasn’t until the 19th century that people started distinguishing something as unique pumpkin and then these different stories started developing. Pumpkin was kept in production because it was cheap. Farmers used it for substitute for livestock feed. It was considered a food of last resort for people, associated with the small family farm that wasn’t a part of the big market economy. Just at that same time people aren’t really using it for practical reasons anymore, they’re moving into cities and Americans are getting nostalgic about this old-fashioned farm life. The pumpkin starts appearing in poetry in the mid-19th century and paintings. People start celebrating because they’re nostalgic for that old life of old times and the pumpkin in particular. Its recent popularity and the obsession with pumpkin flavors has sparked a bit of a backlash. Has America’s love for pumpkin become a joke? It’s always had these negative connotations. It’s just now because less people are living on the farm that those associations aren’t as negative as they were in the past. There’s a sense still you can make fun of someone for being [a country bumpkin] from rural areas. Ichabod Crane in the 19th century in “Sleepy Hollow,” he’s scared and he’s this silly character and he’s associated with the pumpkin. He thinks it’s this ghost coming to get him, but it’s really a pumpkin head. For a man, a pumpkin head is someone that’s pompous, that’s full of themselves and not so smart. It’s still used in political cartoons. You can see politicians being illustrated with pumpkin heads. Does this popularity help or hurt pumpkin producers? I think it all ties into helping these small family farmers. It’s a niche market for small family farmers, so for example, many small family farmers pulled up their pigsties and put in a parking lot and pumpkin patches because they made more money six weeks out of the year instead of raising hogs. But, why pumpkin? Sales for Starbucks' other seasonal beverages, like the Eggnog Latte, come nowhere close to the company’s sales of Pumpkin Spice Lattes. Why the lack of nostalgia there? There’s really no practical reason for this answer, right? There’s corn, apples, cherries in American culture that have strong folklore traditions but they also have this very practical use. There may be something great about a big apple, about 12 ounces or something, but that doesn’t compare to the world record of a 2,032-pound pumpkin. It’s a very American story. In Germany and France, you go into the markets and now they’re starting to have big slices of pumpkin out there, but there’s no sense of ceremony. It’s just shoved next to zucchini and lettuce. What’s the most unusual pumpkin hybrid you’ve seen in your research? There was a Tiffany’s crystal pumpkin key chain that was a pretty good mix of metaphors and association, so that was a pretty funny one. You can have a zumpkin, where you mix a zucchini and a field pumpkin and now there’s a lot of appreciation for these old-time varieties. While many foods that contain "pumpkin" are automatically considered to be healthy, some pumpkin-flavored foods may actually be quite the opposite. Erika Edwards reports. Your basic Thanksgiving pumpkin pie is probably my favorite recipe. The first time it appeared was in 1796. The first cookbook, “American Cookery” by Amelia Simmons, was first published in the U.S. That was the first time the pumpkin appeared as a pie and the first time the squash appeared as a vegetable. So I think in terms of flavor and tradition, it’s my favorite.